Over the weekend we celebrated Nige’s birthday in the Lake District, waking up in our AirBnB on Sunday morning and enjoying cake in the garden. On Friday afternoon I’d baked the chocolat-iest of chocolate cakes (using this recipe from Minimalist Baker using a whole cup of cocoa powder), kept it in the tin, popped it on a plate, covered it in tinfoil and it sat at my feet on the three hour drive down to West Cumbria. 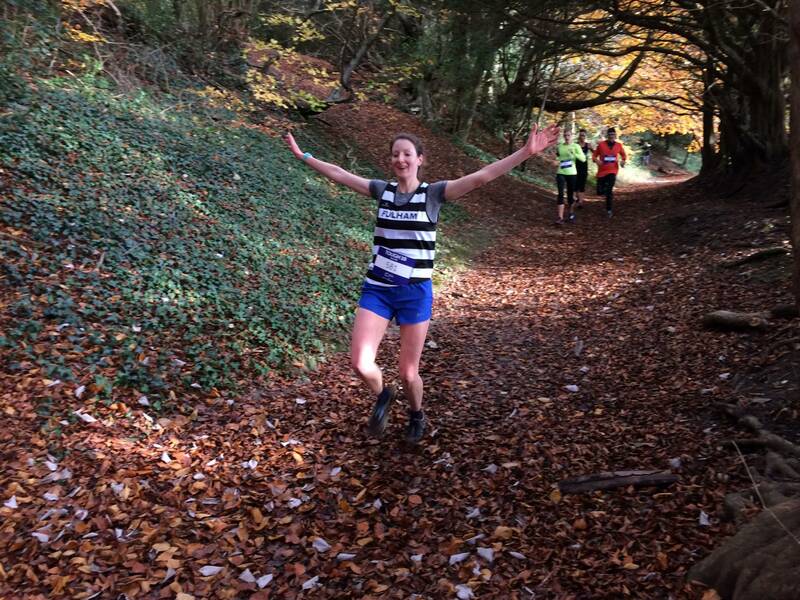 After a long day out around the Buttermere Horseshoe race on Saturday, supporting our runners on one of the toughest hill races I’ve watched unfold, we had a relaxing Sunday planned to celebrate race achievements and a birthday. 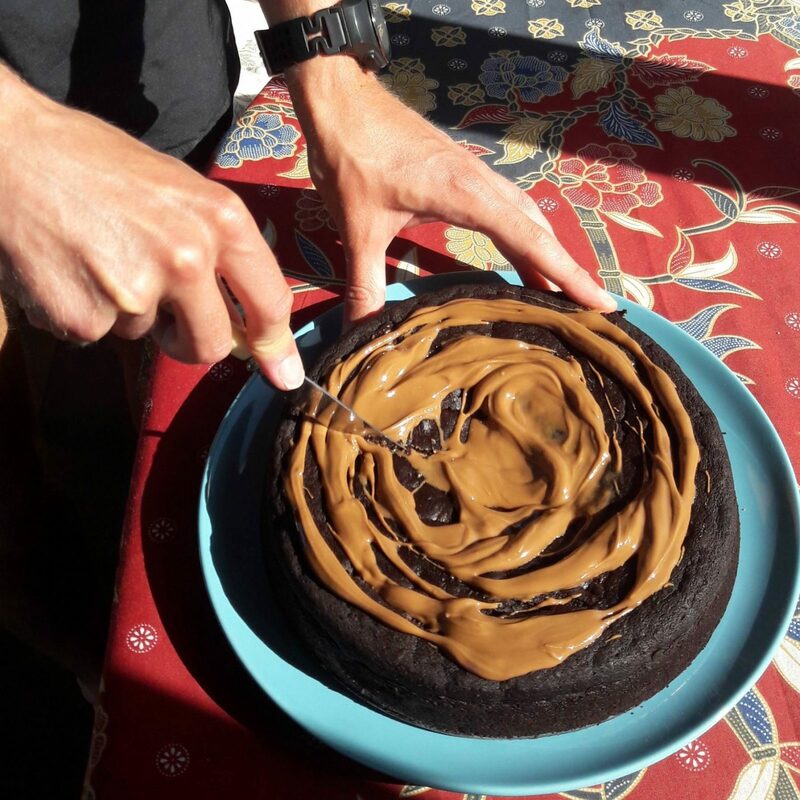 I woke up early to ice (read slather/drizzle) the cake with chocolate peanut butter – a new find from Fuel – and we hopped across the dewy grass to the summer house in our host’s beautiful garden to make birthday wishes, cut the cake and share slices with cups of tea for breakfast. 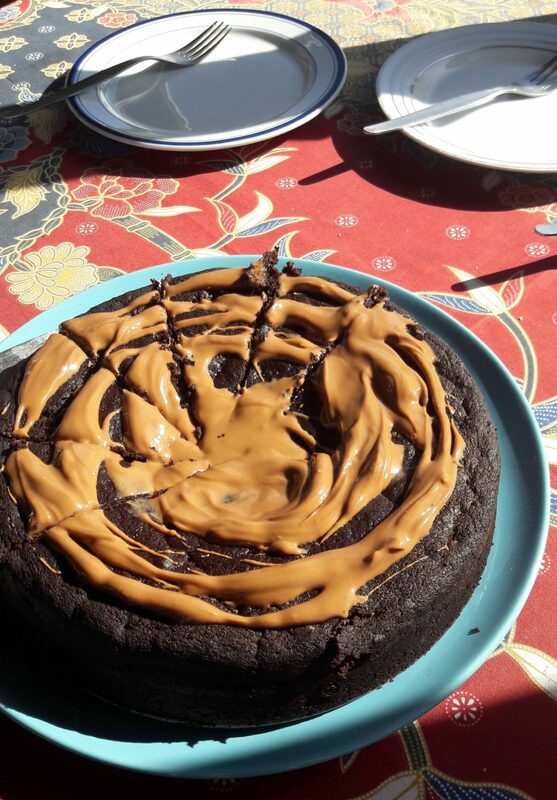 It was delicious and very un-vegan – rich, decadent and perfect for a birthday treat – I’d highly recommend trying the recipe if you’re looking for a celebration cake. After our first breakfast we got ready to leave our host and make our way to Keswick for the day, the heart of the Lake District and a lovely town to explore full of shops, cafes and of course the lake Derwent Water. 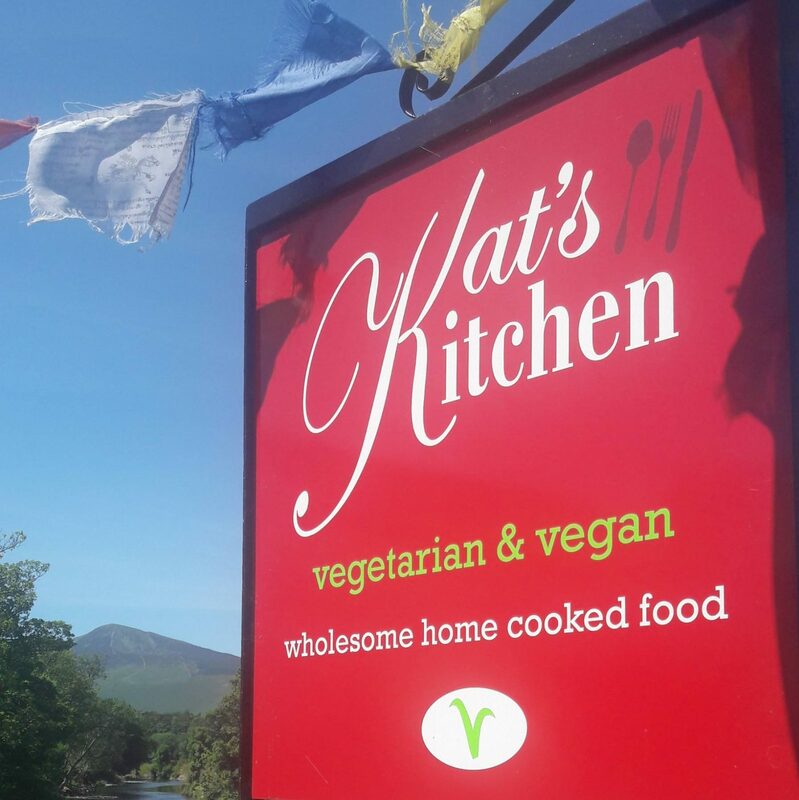 After a very sweet first course for breakfast we were on the hunt for something to satisfy our savoury taste buds for brunch and after lucking out on free parking thanks to a lovely couple just leaving the car park we hopped over the road to vegan and vegetarian cafe Kat’s Kitchen. 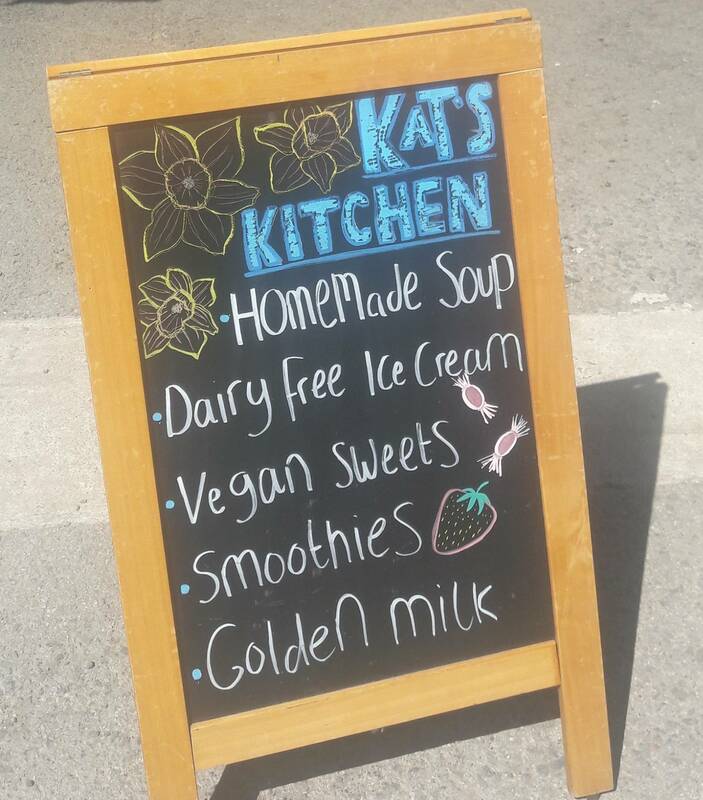 The boys all enjoyed the all day vegan breakfast with sausage, bacon, black pudding, tofu scramble, hash browns, spinach, tomatoes, mushrooms, beans and toast – a hearty dish and well executed – while I chose the falafel wrap with homemade hummus and avocado, and an iced oat milk latte, perfect for a hot day. A lovely, homely cafe, busy with cyclists and travel enthusiasts, and again I’d highly recommend trying it out if you’re ever visiting Keswick – they had a great selection of cakes too but we were all cake-d out! We walked off our second breakfast with a stroll into the town, nipping into most of the outdoor shops to look at running gear (which none of us needed!) and then onto Derwent Water with incredible views of the mountains surrounding it. We all vouched to spend more weekends like this exploring the Lakes. As Scots our first thoughts to get out of the city for the weekend is to head North but if we spent the same time in the car travelling South we could have adventures like these in the Lake District, with all its incredible trails, mountains and open water to enjoy. Have you enjoyed a trip to the Lake District and have tips to share for new adventures? Let me know! Next Post Isn’t all wine vegan?